In GenoPro, you can store information relating to individuals' occupancies, from their place of residence to their travels. Each occupancy represents a single location where the individual has lived or travelled. For instance, the primary house and the work place should be two separate occupancies, as they have different addresses, phone numbers, and sometimes emails. Also, they may be used in different timespans of the person's life. The location of the contact or the occupancy. The source information of the contact. The date on which the occupancy began. The date on which the person left the location. If the start and/or end date is unknown, you can enter the duration of the stay at that particular location. If both start and end dates are entered, this value is automatically calculated. The email address of the individual. You can send an email directly to the individual with the [Send Mail] button. 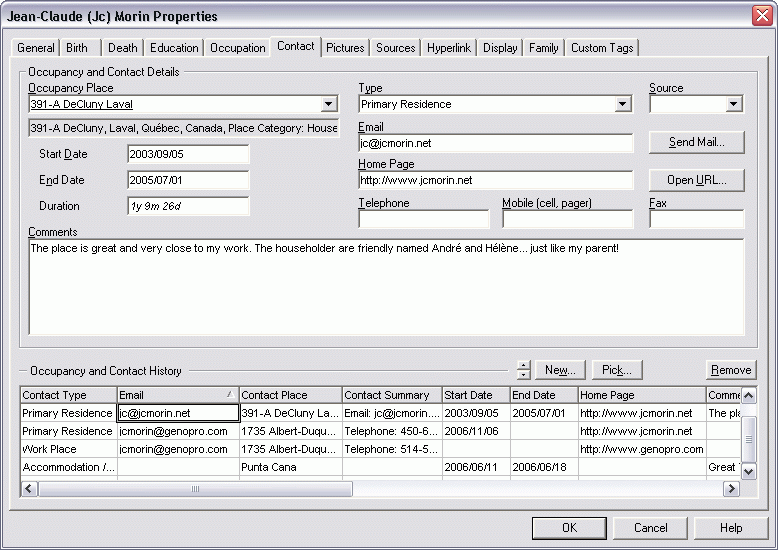 The Web page of the contact. To view the web page in your browser, click the [Open URL] button. Phone numbers where this contact may be reached. Make sure you have seperate entries for personal and professional phone numbers. For instance, the phone number at work should be found in another contact entry under Work Place. Any additionnal information relating to the contact entry. You can add and remove contact information with the [New] and [Remove] buttons. To change the order of the contact details, use the arrows.